Archer’s Choice TV personalities Ralph and Vicki Cianciarulo are awed by these tundra monarchs that flourish in a harsh, barren land. Caribou. They are one of the most underrated animals we hunt. 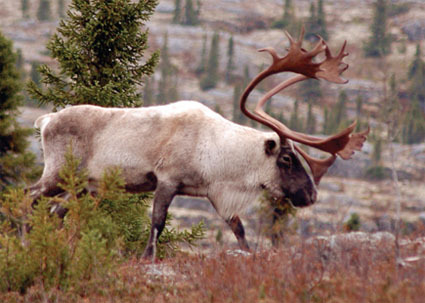 Where they call home is one of the toughest areas to survive, and the caribou not only survive, but flourish. Crossing freezing water is nothing to these magnificent animals. Add covering thousands of miles across barren ground, pounding snowstorms, rain and biting bugs, wolves packing up and chasing them down, and you quickly get the picture. These animals are tough. Never underestimate them. They were familiar and unfamiliar. I could recognize the clicking of the hoofs, the tundra trembling underneath our feet—even their home terrain seemed familiar. But those grunting sounds were not. As I drifted off to past caribou hunts in this great land, my memories overtook me, and I was reminded of years gone by when caribou were all over. Suddenly my subconscious broke into reality. Right in front of us, no less than 20 yards away, there they were: bulls all around. Then the air filled with the crash of two white tundra patriarchs going at it right in front of us. Tundra flew with every grunt, snort, push and shove. Antlers locked, thrashing all over. Even while these two bulls kept on going at it, other bulls kept cruising through, a constant, steady flow of caribou. The rut was on, and we were in the middle of the action, thanks to Peter Palmer, who invited us up to hunt with him at Mirage Outfitters in Quebec. Now this was the first time we have ever been up in this country in mid October. Normally the weather is cold, windy, snowy and just plain miserable, but not this year. We had brought cold-weather gear, and we were not that prepared for this mild, sometimes warm, sunny climate. The weather had these critters so screwed up they were heading north when normally they should be heading south. How is it that Murphy’s Law comes into play for all of us at one time or another? Peter has been chasing a dream of establishing the ultimate caribou hunt up in Quebec for years. If you ask us, we think he’s found it. Hunting the Quebec/Labrador caribou at this time of year is awesome. Nearly all the bulls have long white manes, and their antlers are polished with a rich golden tone to them. They are what we all dreamed them to be: tough, majestic-looking creatures that withstand the elements as they cross the open tundra without a care in the world. They are and always will be a migratory animal. Once you experience the rut, you may never look at these magnificent animals the same way again! So many times we take caribou for granted, judging caribou hunts by what we see on video, in articles and on TV. Seeing the migrations, The Rut, and the pure existence of these tundra monarchs is what it is all about and truly why we hunt. Mirage Outfitters guides on terrain that is very broken up. From timbered draws and thick vegetation, to rock ridges and tundra flats, this makes for some very close encounters and awesome hunting. This is not a hunt for anyone who depends on a firm schedule. Up here everything depends on the weather, and you must be prepared to run and gun in a minute’s notice or pack it in and keep a good attitude. As our two bulls broke up and went on their way, we spotted another bachelor herd coming across the river in our direction. Vicki and I prepared ourselves. As they came through the timber there was no doubt in our minds about which one was the big daddy. Vicki, knowing the distance, held her single-pin TruGlo sight in the center of the bull’s chest. At less than 20 yards she released her Beman Black Max, tipped with a Shockwave head. In less than 20 seconds her giant bull was down and, let me add, right in the middle of a swampy bog. After taking care of her bull, our guide, Ben, and we packed the meat, cape and antlers up to our pick-up point and headed back toward our natural funnel to continue our hunting. It didn’t take long to spot more bulls working their way across the tundra toward us. The wind still in our favor, I quickly started ranging my distances for the moment of truth. It wasn’t long and we had bulls on top of us, heading the same direction as all the others before, up and over the ridge. The only thing I needed was one bigger than Vicki’s. Small bunches of bulls come through. It’s hard if you have never been on a hunt like this to pass up so many animals, but when you are waiting it takes patience more than hunting skill. As a big herd came, the animals followed the scent trail of the other caribou to our right. A big bull approached, waving his antlers back and forth through the timber as he came up over a rock outcropping. He turned broadside. I took my shot. My Hoyt drove the Spitfire-tipped Beman HIT arrow home. In less than 35 yards he went down as the tundra once again trembled. Even though he was down, we sat and watched as bull after bull kept chasing cows through our area. After a short wait we took care of the bull, then sat again in awe as we watched bulls chasing cows, grunting, fighting and doing what they have done for thousands of years…. We realized that in all the caribou hunting we have been very fortunate to do, cruising for caribou during the rut is where we want to be again. Bow Setup: Your normal bow setup for whitetail deer will do everything you need it to do. I like the NAP QuikSpin vanes on my Beman arrows. They control your arrow better in windy conditions and are waterproof, which is important in caribou country. Any broadhead you are comfortable with shooting will do the job. Bow Case: Our hard case for travel is the Plano Protector. After weighing all the other brands, this one came in the lightest, and it offers superior protection. This is a good point to make here: Take everything out of your bow case and weigh it. You will be shocked just how much your case weighs alone. 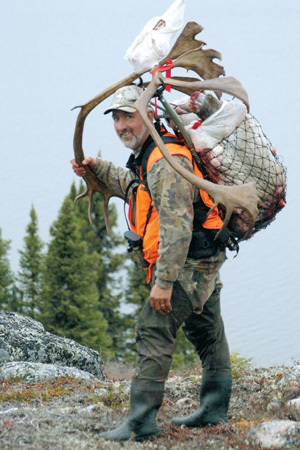 On most caribou hunts there are weight limits, and every ounce counts. Optics: We go nowhere without our Nikon rangefinder and binos. Otherwise, judging distance in the open tundra can be a big problem. Clothing: Always travel with layers. Bring rain gear that is lightweight yet protective in all elements. Do not bring an 8-in-1 parka system because 1) it weighs too much, and 2) it is too bulky. I am a big fan of Thinsulate and down insulation. We always pack our Cabela’s lightweight down jacket, silk long underwear, and a medium-weight set as well as our MadDog Silent Shadow Fleece with Scent-Lok liner suit, a few pair of wool socks, a couple T-shirts, a wool sweater and camp clothes. Footwear: Our boots are Muck high rubbers or the LaCrosse AlphaBurly sport insulated. You will be on a lot of wet surfaces and slipping can be an issue, so make sure you have good gripping bottoms. Packs & Packing: A backpack or large fanny pack is a must to pack all your necessities as well as be able to tie on your extra clothes. Everything we pack is on large Ziploc bags, even our down coats fit in these allowing 100 percent waterproof protection even in our packs. Make sure you have a blaze orange vest (mandatory). Bring a good digital camera, extra cards and batteries, and store them in a good Ziploc bag. We pack all our gear in a medium-size duffel that fits easily in the planes. Please remember once you pack everything, weigh it and make sure it is under the limit. If not you might be charged a lot of extra $$$, or you might have to leave something back. Regulations: Go to www.bonjourquebec.com for more information.